About five months ago I was given an opportunity to write a chapter for a collaborative book. My initial reaction was, I didn't have time, I wasn't sure what I would write about, and I was doubtful that I could write a quality chapter that would equal all the other women who participated in the project. What I found out about myself was a revelation and one that gave me increased confidence to keep moving forward and to uplevel my exposure to new experiences. I realized that it was time for me to "power up" and start tackling some of my own negative self-talk that had kept me from stretching. The fear of rejection and failure are always out there lurking in our conscious and subconscious mind. But I decided to write a chapter in spite of my fear. As a result, I learned the value of pushing past my fear of failure and rejection and taking a leap of faith. I learned the value of doing "it" with fear ANYWAY. "There comes a time in all women’s lives when they feel they can’t face one more challenge, setback, or issue of concern that keeps them from achieving the life they truly deserve and want. These are challenging times, and there has never been a more complex moment in history to be a woman. Barriers are being broken, and glass ceilings are being shattered; however, too many women are still being left behind. But even with the chaos and confusion that ensues, hope and opportunity abound, and that is where Power Up, Super Women comes in. 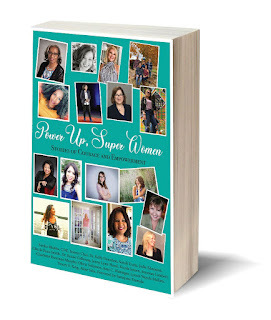 Within the pages of Power Up, Super Women, authors from across the globe share their messages of hope and empowerment. These authors are women who faced adversity, failure, sickness, disappointment and hurt. Whether the stories are about illness, divorce, domestic violence, diversity, child birthing, climbing the corporate ladder, depression, and more, the authors leave the reader with a sense of inspiration and hope as well as the desire to rise up with the courage to face whatever it is life has in store. I believe in this book, "Power Up Super Woman- Stories of Empowerment and Courage". The stories within are not only motivating but gave me the empowerment to write the back cover. The chapters are written by women who come from different backgrounds but are all on the same journey - one of courage and ultimate victory. Pre-order a copy now and get an autographed copy, of this amazing book about women who have faced their fears, powered up their courage, and wrote their story in the hopes of helping others who may have struggled through similar experiences. Click here to order "Power-Up Super Woman - Stories of Empowerment and Courage"